It can be coined as mere luck, that someone as lowly ranked as 100 beats the tennis superstar in such a fashion. But this was other way around, Rosol with his first time entry at Wimbledon proved his mettle in an emphatic manner.This is something can no tennis lover would be able to forget in a long time.With Lukas Rosol beating Nadal in a five setter affair becomes the lowest ranked player to beat him at Grand Slams with 6-7(9),6-4,6-4,2-6,6-4 victory over the King of Clay. This also marks the earliest defeat in Grand Slams in seven years for him packing his way back home in just second round. Rosol made his impression early on with his hard hitting forehand, and aces. Mostly his winners remained in the range of 90mph, and Nadal being the most athletic runner around the court was made merely a kid who is in search of redemption. He was able to get him over in the tie breaker 9-11, where Rosol had 2 chances to earn the set but Nadal defied his chance. Next two sets remained totally hanging in Rosol's favour, and Nadal had no answer to his hard hitting, supreme passing shots.Nadal after earning the fourth set, the Centre court was covered due to bad light and resumed after 30 minutes. 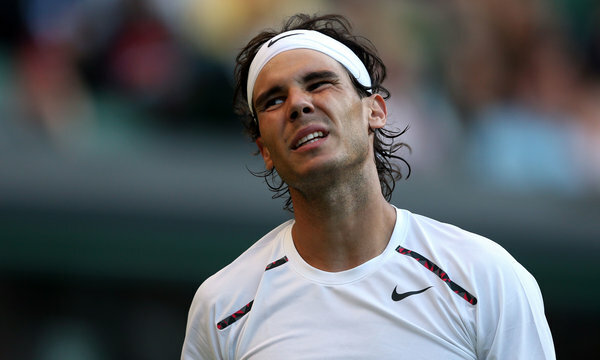 Nadal who on return was doing good service, fell to some bad return shots, of which Rosol took full advantage and broke him in the first set after resumption of the game. After that there was no looking back in just 34th minute, glory and history both was in Rosol's way. With this Murray's draw is wide open, with the exit of Nadal. But the way Rosol performed today, he can eventually pose a great threat to all the seeded players.